This upcoming MediaPad T3 slate is expected to debut as a mid-range device similar to its smaller-screen siblings that were already announced. According to GFXBench, it is powered by a quad-core Snapdragon processor, next to 3 GB RAM and 32 GB internal storage. Huawei recently unveiled two MediaPad T3 tablets. These Android-driven slates feature 7-inch and 8-inch screens, while the upcoming MediaPad T3 Lite 10 has a 10.1-inch display with 1,920X1,200 pixels. 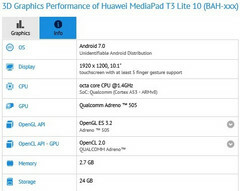 The Huawei MediaPad T3 Lite 10 has recently surfaced on GFXBench, quite a few of its features coming to light this way. In addition to the screen size and resolution mentioned above, there is also an octa-core Qualcomm Snapdragon processor with Adreno 505 graphics. Although the processor model is not specified, there are only two chips using the Adreno 505 at this time - the Snapdragon 430 and the Snapdragon 435. The tablet also has two 8 MP cameras (one on each side, not a dual setup), 3 GB RAM, and 32 GB internal storage. 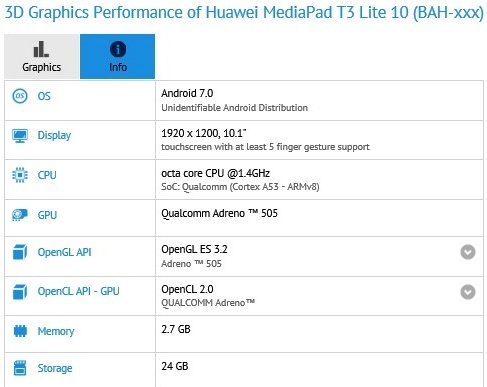 Huawei MediaPad T3 Lite 10 should hit the market running Android 7.0 Nougat, but its launch date and price remain unknown for now. We will get back to it as soon as we find out anything else, so stay tuned.